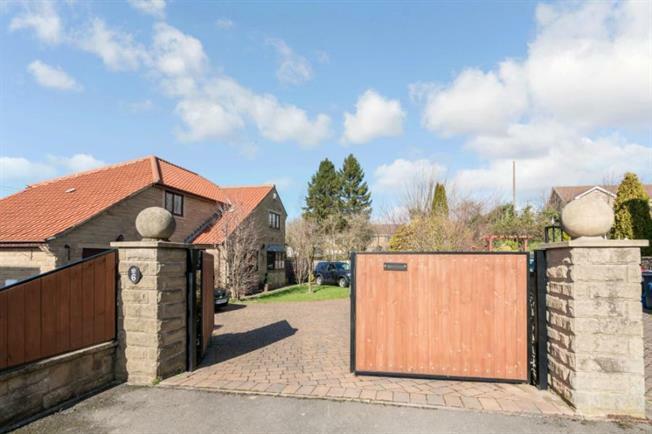 4 Bedroom Detached House For Sale in Rotherham for £300,000. BEAUTIFUL VIEWS TO THE REAR with this spectacular family home. Situated at the head of a cul de sac with gated driveway. The property is ideally located close to amenities, local schools and transport links. Viewing is a must to appreciate this spacious home situated on a corner plot. In brief the property comprises of entrance hall with dog leg spindle staircase to first floor landing. Cloakroom having a two piece suite. Study. Spacious lounge giving access to the conservatory. Conservatory overlooking the rear garden and rear views. Dining room with French doors to the garden. Breakfast kitchen having an extensive range of fitted wall and base units in shaker style including integrated appliances. First floor landing having four bedrooms, master with en suite. Family bathroom with four piece suite. Outside the property is accesses via a gated block paved drive, lawn areas and access to the single garage. Rear garden with views over fields and having patio, lawn and mature shrub borders.